Even if you don’t know the band, you’ll know ‘Teenage Kicks’ and a stack of other singles. 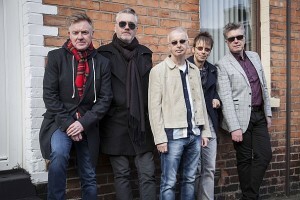 The Undertones had a few years of putting out great pop single after great pop single. You’ll probably know songs like ‘My Perfect Cousin’, ‘Here Comes The Summer’, ‘Jimmy Jimmy’, ‘You’ve Got My Number’, ‘Wednesday Week’, ‘Julie Ocean’, etc, etc. Reforming in 1999, with a new singer, the band put out two really good albums and tour now and again. The very first gig I went to was The Undertones in Autumn 1979. The T-shirt is long-gone but first love stays with you. I was delighted to be able to get some of Damien O’Neill’s time to put some questions to him. 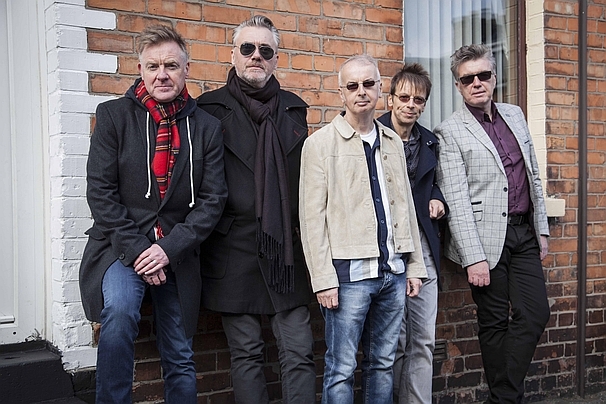 The Undertones are making a small tour right now (dates below). Very well except for a stinking cold thank you. I was surprised how much I enjoyed your gig in Leeds in 2011. As someone who had an Autumn ’79 tour T-shirt, a Positive Touch tour T-shirt and a ticket that sadly didn’t get used for the Sin Of Pride tour, I was expecting a nostalgia fest but nothing more. How do you feel on-stage these days? We’re all happy campers these days. We’re all still friends and get on really well. I think it shows onstage. Also helps we have a great crew working with us. What makes you want to tour and play live? Part of it is getting the chance to visit and see interesting places (this year we did a short tour of Australia and New Zealand for the first time) but mainly I’d say we do it because it’s actually still fun and you do get a real buzz when you do a great show. A good sound onstage and from the front of house plus band on top of their game and receptive audience always makes it very special. How come we don’t see you play nearly enough? Most of the band have proper steady jobs which means we have to carefully pick and choose what shows to do as getting time off work is limited. That’s why we normally only play at w/ends. I think it’s better we don’t play too often because we can approach each show with an enthusiasm and freshness that we won’t have if we were playing every day and going through the motions. What do you wish you’d known in the seventies and eighties that you know now? Alternative tunings for the guitar. Me and John always used standard tuning back in the day and it was a revelation afterwards when we discovered that with alternative tuning you can come up with all sorts of weird and wonderful things on your instrument of choice. What do you think it is that makes it easier for bands to keep playing rock and pop as they age? For the aged pop star, I’d say nice hotel rooms and warm dressing rooms with a full rider certainly helps. Oh and early start time onstage is a plus these days also. The two post-reformation albums felt honest and authentic. Any prospect of more new material? Afraid not. We’ve been very lax about writing new songs for a new Undertones record. However, I have just recently finished recording a solo record which I’m gonna crowd fund soon. John has also been working on new music for a different project of his. Maybe once we get these side projects out of the way, we can seriously start work on new Undertones material. Any chance of a That Petrol Emotion revival? I think it would take something like a TPE song to be used on a successful movie to start a revival again. We have a very intense and passionate following but it’s quite small and we’d need some decent exposure to get us interested to maybe reform again. We last did in 2010 (a few USA and U.K dates) and that was wonderful but short lived. What are you proudest of from The Undertones’ work? There’s a great canon of well-crafted songs there, especially the singles. I do find it amazing that we were able to come up with a mostly continuous high standard for the short period we existed originally. There’s a timeless quality to a lot of them which we now appreciate but didn’t back then. Also the fact we did all this while living in Derry which was going through some pretty horrible times. What is your favourite Undertones single? For me personally, ‘Its going to Happen‘ is my favourite single. It’s very poppy and full of hooks and always brings a smile to my face when I hear it. Feargal’s vocals on it are amazing. I was also very involved in it as I wrote all the music including the brass bits and suggested the fade in intro and the fade out middle section. It’s a toss up between the first 3 but I would probably say our debut has an edge above the rest (if you can discount the awful version of True Confessions). The enthusiasm of the playing is infectious and you can tell we couldn’t wait to get all the songs down on tape. Probably the happiest period in the band. What is your ideal encore choice? We always put ‘I know a Girl’ in the encore. A sure fire winner to get people singing along. Also ‘Top 20’. ‘My Perfect Cousin’ has been a good show encore end song also recently. Sometimes we might do a cover also if we feel like it. Is there anything you wish you didn’t have to play but people insist? For a while I got really bored with playing ‘Mars Bars’ but have recently seen the error of my ways and will play it if requested. What’s your favourite band that is still gigging? Nick Cave and the bad Seeds although I’m disturbed to hear they seem to be ignoring the BDS request not to play an upcoming show in Tel Aviv, Israel. That saddens me. Thanks for your time, Damien.